LG has revealed the new LG Shine Plus Android-powered device in Canada. The LG Shine Plus features extensive use of Google Mobile Services including Google Search, Google Maps, Picasa, YouTube and Android Market. Easy access and seamless integration with Google Mobile Services on the LG Shine Plus allows for consumers to connect quickly and effortlessly to their world. The LG Shine Plus also comes pre-loaded with the LG App Advisor, which allows users to download the best applications available on Android Market with minimal effort. This is just one way that LG is customizing the mobile world and allowing Canadians to quickly connect with the best of the web. The LG Shine Plus features a 3.2-inch touch screen and has the first ergonomically designed keyboard, providing the comfort and ease of use that consumers have been searching for. 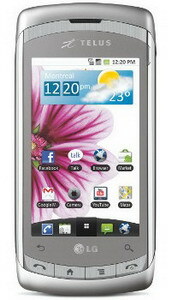 LG Shine Plus also features a 5.0 megapixel camera with a built-in flash and Photo Editor, Android 2.1, QWERTY keyboard, WiFi b/g/n, 3G, and GPS. More information is available from Telus. 0 comments on "LG Shine Plus for Telus"